I remember when my family first got a cd player. My parents were in starving-student mode for the majority of my childhood, and we had a hulking black tape/radio player until I was about seven or eight. From that point till my mid-teens, a few cds dominated my household, a random medley of gifts and albums of bands we saw live at the nearby University of Florida Center for Performing Arts. We played these albums over and over, with a patience for listening to the same songs that I seemingly lost years ago, replaced by an itch to always find something new. Among the few albums that were on constant repeat was the Best of Mississippi John Hurt. 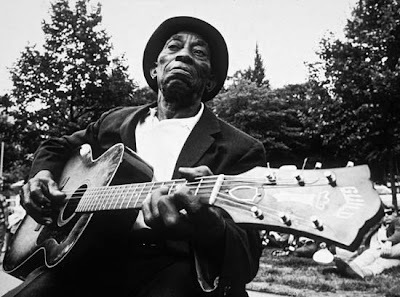 Mississippi John Hurt is about as classic as they come. Just an oldetimey blues man, singing on stage with a guitar, John Hurt’s songs are about the simple things-his hometown, the Monday morning blues, problems with women-the sounds of regular life on the delta. What makes the songs unique is Hurt’s extraordinary voice. Thick, gravely, and aged with the years, Hurt’s voice is a weathered instrument that plays an amazing duet with his guitar. The two together sound even better live, and the album that this jam is on is the very essence of live, with Hurt making a mistake or two alongside the laughter and clapping of the audience. But in the end, it just adds to the realness of the track. I never did know what a Salty Dog, and still don’t, but Hurt makes everything sound so good, that after listening to this jamandahalf a few times, it’s hard not to want to be someone’s salty dog too.